TACLOBAN CITY – Leyte Vice-Governor Mimyet Bagulaya was unanimously elected as the Chairperson of the Vice-Governors League of the Philippines during the elections held on July 23 in Manila. When reached via phone patch, Vice-Governor Mimyet said she is humbled by the trust given to her by the vice-governors across the country. The Leyte Vice-Governor was unopposed in her bid to become the league’s chairperson. All the other league positions had at least two candidates each, Vice-Governor Bagulaya, a hard-core Liberal Party Member, disclosed. It would be recalled that the lady vice-governor who is on her third term as vice-governor, also was unopposed during the latest campaign for the synchronized and first automated elections. Vice-Governor Bagulaya disclosed that as of this writing she is still in Manila to attend the first State of the Nation Address of President Benigno Aquino on July 26. Elected as President of the Vice-Governors League of the Philippines for 2010-2013 was Vice-Governor Leonides Fausto of Cagayan, who is also a member of the Liberal Party. He was forced to run in another party during the last elections because there was already another candidate who run under LP, Vice-Governor Bagulaya said. Vice-Governor Victorio “Baby” Suaybaguio Jr. of Davao de Norte was elected as the Executive Vice President. Elected as Secretary General was Masbate Vice-Governor Vince Revil while Aklan Vice-Governor Gabrielle Quimpo was elected as treasurer, the position Vice-Governor Bagulaya held during the previous term of office. Vice-Governor Cresencio Pacalso of Benguet was elected as auditor while Batangas Vice-Governor Mark Leviste was re-elected as the League’s PRO. Vice President for Luzon is Mario Gene Jaro Mendiola is the current Vice-Governor of the province of Occidental Mindoro. Elected as Vice President for Visayas is Vice-Governor Mike Maamo of Southern Leyte, while elected as Vice President for Mindanao was Vice-Governor Leo G. Lasacar of Camiguin. Vice-Governor Bagulaya said that the abovementioned officers compose the executive committee of the League. The directors for each region will be appointed, she added. The League of Vice-Governors of the Philippines has the primary purpose of ventilating, articulating, and crystallizing issues affecting provincial government administration specially those concerning local legislation and securing, through proper and legal means, solutions thereto. CATBALOGAN CITY – Alarmed at the high number of dengue fever cases, Calbayog City Mayor Reynaldo Uy through his Memorandum Circular 002 ordered the 157 barangays for a clean up drive to avert the situation. According to City Health Officer Dr. Sylvia de Guzman, the dengue cases started with 8 cases which rose to 21 the following week. De Guzman added that of these cases four dies coming from Brgy. East Awang, Begaho Tinambacan Norte, and Malopalo. Dr. de Guzman noted that most victims are children and that in the whole Region 8, Calbayog is number five with the highest number of dengue cases. Recently, Calbayognons made a clean-up drive in their barangays as part of the ‘Iwas Dengue’ campaign. During the weekly LGU press conference, City Population Officer and Tri-District Development Program Office (3D) focal person Ruben Adona explained that everyone will be mobilized to ensure that dengue-causing-mosquitoes will not transfer to other barangays whose folks are not cleaning. “Let us not wait for the health people to declare an outbreak,” Adona stressed. Since January of this year a total of 288 suspected dengue cases have been reported with the 4 deaths. Grace Campo, surveillance nurse of the city health office (CHO) said that it is possible that there are more cases as she can only record those hospitalized on the four hospitals in the city. Campo suspects that other dengue patients may still be in hospitals in Tacloban City. Presently some 60 of the 157 barangays have been affected by the tragic dengue illness. Brgy. Matobato has posted the highest number of cases with 30, followed by Dagum 18, Oquendo Poblacion 17, Tinambacan Sur 16, Balud 11, Capoocan ug East Awang 10. The different barangay and schools are enjoined to clean their homes, schools, surroundings, check for stagnant water and dispose and clean the canals. CATBALOGAN CITY – The Girl Scouts of the Philippines (GSP) Samar chapter treated their differently abled peers in a day of fun, games and food treats on Friday. The activity dubbed as “A Day for Differently Abled Girl Scouts” had them singing, dancing and just having fun through interaction with other girl scouts. At least some 32 differently abled students from all over Catbalogan City joined the fun with their parents, teachers, guardians and nannies at the GSP Heaquarters in Catbalogan, Samar. Ms. Trinidad Escobar, GSP Council President told PIA that this is their contribution to the nation’s observance of the National Disability Prevention and Rehabilitation (NDSPR) Week from July 13-23, 2010. She said that NDSPR aims to stimulate public awareness of disability issues and concerns and also to promote the inherent rights of persons with disabilities. In a message done by Ms. Florfina Daradal, a GSP council board member, she urged the girl scouts not to lose hope for being differently abled. She told the story of one woman stricken by polio, but was able to study being a teacher and ended up teaching home economics to children. She then urged the parents, nannies and guardian to continue nurturing them despite the challenge. To show their talents, visually impaired Mary Jane Cabornay sang a Christian song which she claimed was composed by the blind singer and composer Art Ramasasa. Ronalyn, another visually impaired lass, sang Jessa Saragoza’s “Bakit Pa”. Bernard Longasa another visually impaired lad of 12 played on the organ and sang Willie Revillame’s “Ikaw na Nga” the later song had the differently abled kids singing with Bernard. For the deaf and mute kids, dancing with Jollibee mascot proved to be so enjoyable, it was almost a non-stop dancing showdown. The kids were also treated to a spaghetti snack given for free by Jolibee Manager Shaun Paul Pondiong. Gift packs were also distributed to all differently abled girl scouts. TACLOBAN CITY – In order to encourage small fisher folk to venture in mariculture parks, the Bureau of Fisheries and Aquatic Resources Region 8 (BFAR) helps fishermen organize themselves into cooperatives and enroll in its "Rent-a-Cage" Program. Under this scheme, the fishermen could start raising fish and pay the cage rent, including the cost of production after selling their produce, according to BFAR Region 8 Director John Albaladejo. Already, a number of fisherfolks group in the municipality of Basey, Samar have already availed of the BFAR’s Cages-for-Rent program, the good Director said. BFAR encourages the fisherman to organize themselves into cooperatives and enroll in its “Rent-a-Cage Program” to enable them to start raising fish and pay the cage rent, including the cost of production, after selling their produce. Within two years or an average of four harvests, the group shall have been able to fully pay the cage and acquire additional cages for their business venture. A bamboo fish cage costs P470,000 and a GI pipe cage, P576,000. This amount covers the cost of the cage, fingerlings, feeds and labor, among others during the grow-out period, BFAR said. Within a period of two years or an average of four harvests, fishermen cooperative could be able to pay in full the cost of the cage and acquire additional cages for their business venture. Besides empowering small fisher folk, the establishment of mariculture parks also helps mitigate the ill effects of climate change on the fisheries sector. Coral bleaching, changes in the migratory patterns of fishes, occurrence of dreadful diseases and even mutation are among the adverse effects of climate change on the marine environment. Mariculture parks provide a respite for marine life to flourish and increase in population without any adverse effects on the environment. The Bureau of Fisheries and Aquatic Resources (BFAR) has established 40 mariculture parks nationwide. The latest of which are the 2 mariculture parks in Sorsogon. The other mariculture parks in Luzon are found in Sto. 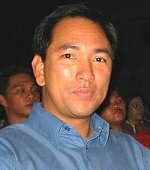 Tomas, La Union; Casiguran Aurora; Padre Burgos and Tagkawayan in Quezon; Looc, Romblon; San Jose City, Occidental Mindoro; Sta. Cruz, Marinduque; Calapan City, Oriental Mindoro; and Ragay and Sangay in Camarines Sur. In the Visayas, these mariculture parks are in Talibon, Bohol; Brgy. Malahog, Calbayog City; Basey and Quinapondan in Eastern Samar; San Jose, Sta. Rita and Laoang in Northern Samar; Liloan, Southern Leyte; Batbatngon, Merida, Tacloban City and Ormoc City in Leyte; and Navalin Biliran. Those in Mindanao are located in Tungawan, Sibugay, Margosatubig, all in Zamboanga del Sur; Zamboanga City, Murcielagos, Rizal in Zamboanga del Norte; Balingasag, Misamis Oriental; Sultan Naga Dimaporo, Lanao del Norte; Island Garden City of Samal; Panabo City, Davao del Norte; Mati, Davao Oriental; Surigao City and Dapa, Siargao Island, Surigao del Norte; Barugo, Surigao del Sur; and Sibutu-Sitangkai, Tawi-Tawi. These types of industrial parks in sea that were first conceptualized five years ago by the BFAR include basic infrastructure facilities like mooring systems that are set up in areas identified by marine technologists as ideal for fish farming. Mariculture parks operate much like industrial estates on land, with investors setting up or renting fish cages to grow high-value marine species such as bangus, lapu¬lapu, siganids, seaweeds and other high-value aquatic organisms. Along with the local government unit (LGU) and other stakeholders, a management council is organized by the BFAR and a development plan is crafted to ensure the health of the environment and the sustainability of every mariculture venture. TACLOBAN CITY – Mayors in Leyte and governors in have thrown in their support for Leyte Governor Carlos Jericho Petilla bid for chairmanship of the Regional Development Council in Eastern Visayas. League of Municipalities of the Philippines - Leyte Chapter President Remedios “Matin” Petilla, the municipal mayor of Palo, said the governor is ready for such a post and can help a lot in regional tourism particularly his expertise in information and communication or ICT. “He would do well in helping the region become an ICT hub. He has done it for the province of Leyte and with him as chair, he can also contribute to its growth in other parts of the region,” Mayor Petilla said. Several other mayors in Leyte such as newly-elected Javier town mayor Sandy Javier expressed confidence the governor would be effective as chairman of the RDC. His experience and his performance as a governor in the last two-terms could prove that, Javier said. Meanwhile, governors in Eastern Visayas who recently have grouped together as the Eastern Visayas Governors League has decided to support and endorse Gov. Petilla as the next RDC chair. Northern Samar Governor Paul Daza who has been chosen as the president of the EV Governors League, said that the Leyte governor is the most familiar among governors on regional issues. The chairmanship of the RDC is voted upon by its members and endorsed to the President for approval and confirmation. Aside from the provincial governors, the RDC voting members are the city mayors, presidents of league of mayors, regional directors of major government agencies and Private Sector Representatives. As earlier reported, Gov. Petilla revealed that he has been encouraged for the RDC chairmanship even during his second term started in 2007. He likewise disclosed that he has already made known of this interest to President Benigno “Noynoy” Aquino III. The Regional Development Council serves, among others, as a policy and recommending body related to programs and projects in the region that needs support, mostly funding, from the national government. The Leyte governor, if his bid is approved, would be succeeding former Calbayog City Mayor and now Samar First District Representative Mel Sarmiento, who is said to have made leaps and bounds during his incumbency as RDC chair from 2007-2010. TACLOBAN CITY – Lady Mayor Madeleine Mendoza-Ong of Laoang, Northern Samar, is indeed a champion Mayor. Under her steadfast leadership, her municipality has showed other municipalities how every local government units must align its programs with that of the national government in order to have synchronized development process. After the prescribed three-year implementation of the Kapit-Bisig Laban sa Kahirapan-Comprehensive and Integrated Delivery of Social Services (KALAHI-CIDSS) in Laoang, the Lady Mayor has approved Ordinance No. 130, S.210, firming up its commitment to adopt the project’s principles and processes. The KALAHI-CIDSS is the country’s flagship anti-poverty community development project being implemented by the Department of Social Welfare and Development (DSWD). The ordinance created the Municipal Coordinating Team of the Municipal Community Driven Center as an institutional mechanism to ensure the adoption and sustainability of the completed KALAHI-CIDSS sub-projects. The Ordinance explicitly stated that even if the project has been completed, principles and processes will be integrated into the municipal local government development and planning framework. By adopting processes and principles of transparency and accountability inherent in the KALAHI-CIDSS Community Empowerment Activity Cycle, problems needing immediate solutions will continue to be identified in the respective barangays and appropriate funds will be allocated where these are badly needed. Careful identification need to be done since there are 56 barangays in the municipality. Selected volunteers will take the lead in implementing and managing subprojects as well as see to the operations and maintenance of completed structures. The ordinance took effect last June 30, 2010, 15 days after the regular June 15 session of the Sangguniang Bayan convened by Vice-Mayor Fred Daenaneas. The legislation was duly approved by Mayor Mendoza-Ong. Overseeing the processes and the volunteers will be the responsibility of the Municipal Coordinating Team under the direct supervision of Mayor Madeleine Mendoza-Ong. The team is composed of one municipal area coordinator, a municipal community driven development specialist, one technical assistant, one municipal finance analyst, and two municipal roving bookkeepers. The team is supported by an administrative staff, utility worker, and one draftsman. Funding for the maintenance and operations of the municipal coordinating team was drawn from the 20 percent Economic Development Fund (EDF). Available savings from the General Fund will also be tapped for the team’s operations. Moreover, in anticipation of future development projects, Mayor Ong is eyeing for negotiations with the Development Bank of the Philippines, the Municipal Development Fund Office, the PDAF allocation of Rep. Emil Ong, senators and Party List representatives, small embassy funds, and funding networks of civil society organizations for funds that will finance development projects in the barangays. Local governments must take their cues from the National Government. They must sustain the poverty alleviation projects initiated by the National Government by aligning the same to the local development plans, the Lady Mayor said. 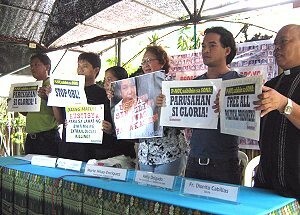 Human rights watchdog KARAPATAN to P-Noy: Prosecute GMA! QUEZON CITY – As they prepare to echo calls for justice in the mass actions on Pres. Noynoy Aquino’s State of the Nation Address (SONA) on Monday, members of the human rights alliance, Karapatan, reiterated calls for the prosecution of Gloria Macapagal-Arroyo and all perpetrators of human rights violations. “P-Noy should not mince words on the issue of human rights. If his SONA will be straightforward and he will talk about resolutions and plans, we demand a concrete answer. Shall he prosecute GMA or not? Can the victims be assured of justice?” Hilao-Enriquez asked. Human rights workers from the different regions of the country, each having experienced the lash of the past Arroyo government’s bloody counter-insurgency campaign Oplan Bantay Laya, said they shall bring forth in their respective SONA mass actions the victims’ calls for justice and the prosecution of Arroyo. Karapatan Eastern Visayas spokesperson Atty. Kathrina Castillo said they also demand “an end to the vilification campaign led by the AFP against activists and ordinary citizens,” as this was used by the past Arroyo government to legitimize attacks against progressives. 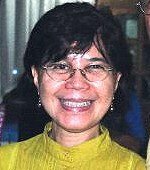 Castillo was herself a victims of numerous threats and harassment including the military tagging that “she is a lawyer of the NPA” in their local radio programs. Meanwhile, Fred Caña, Secretary General of Karapatan-Negros, said they call for justice for victims of killings since Aquino took oath as president in the same weight of calling for justice for the Arroyo government’s victims. “As in the killing of Fernando Baldomero, the first case of extrajudicial killing under his term, we will see this as a measurement whether he is truly serious to end the killings,” Caña said. Baldomero is a Bayan Muna coodinator and two-term councilor from Lezo, Aklan in the Panay region. Fr. Dionito Cabillas, National Coordinator of SELDA, also said the issue of the more than 300 political prisoners all over the country should be a major concern for Aquino regarding civil and political rights. Dennis Abarientos, Secretary General of Karapatan-Central Visayas added that PNoy must end the bloody and brutal counter-insurgency campaign, Oplan Bantay Laya (OBL) I and II, and desist from embarking on a similar program, as this is one of the reasons for the massive human rights violations in the country under the GMA administration. Hilao-Enriquez said they shall continue with a resounding campaign for justice and Arroyo’s prosecution especially in the Aquino administration. “We will definitely push through with the legal actions involved in pursuing justice, to show that we are more than serious in prosecuting all perpetrators. On the other hand, we call on all human rights defenders here and abroad to continue supporting the campaign not only for justice but for a definite end to the killings, disappearances and all forms of violations,” she concluded. TACLOBAN CITY – Eighteen more bricks of suspected cocaine were recovered after two days of intensive monitoring and search operations versus illegal drugs conducted by the members of the Anti-illegal Drugs Special Operations Task Force, Regional Intelligence Division, Philippine Drug Enforcement Agency, K9 Team of the Philippine Coast Guard, Borongan City Police, and Salcedo Municipal Station in the province of Eastern Samar. Philippine National Police Regionn 8 Director Rey L. Lañada informed that at around 8:30 in the morning of July 21, 2010, at Barangay Divinubo, Borongan, Eastern Samar, 16 cocaine bricks were voluntarily surrendered at the Borongan Police Station. The PNP Director said that fourteen (14) cocaine bricks were surrendered by Edwin Doculan, 37 years old; and two other cocaine bricks were turned-over by Edgar Beros, 50 years old. This was made possible through the efforts of the joint elements of Eastern Samar Provincial Police Office, Borongan Police Station, AIDSOTF, RSOG and RID 8, Director Lañada said. Meanwhile, at about 11:00 o’clock in the morning of the same day, two bricks of cocaine were surrendered by Victor Gana, of legal age of Barangay Burak; and Antonio Basiides Labay of Barangay San Roque, both of the municipality of Salcedo. This was made possible through the collective effort of the Salcedo Municipal Police Station led by Police Inspector Gilberto Colima, AIDSOTF, RID PRO 8, K9 Unit of the Philippine Coast Guard and PDEA 8 under the supervision of Eastern Samar Provincial Director Felixberto Castillo. The surrendered cocaine bricks are now under the custody of the Eastern Samar Police Provincial Office, Director Lañada said. The same will be subsequently turned over to the PNP Crime Laboratory 8 for chemical analysis. Director Lañada expressed his gratitude for the all-out support of the local residents in Borongan and Salcedo, Eastern Samar, in informing and surrendering the cocaine bricks to the Philippine National Police. Director Lañada reiterated his call for the local residents not to sell any illegal drugs they might recover. If they do that and they are arrested, the case that would be filed against them will be non-bailable, the good Director added. PALO, Leyte – The old municipal building of the local government here may see to a restoration instead of a full reconstruction says Mayor Remedios “Matin” Petilla. The lady mayor revealed this plan after speculations that the municipal building of the town may well be relocated to the Government Center among other regional and provincial offices and the Leyte ICT Park. According to Mayor Petilla, they did thought of the idea to construct a new municipal building at the Government Center with the provincial government through Governor Carlos Jericho Petilla giving the nod. Mayor Petilla said the present municipal building is more strategically located and more accessible to her constituents that the idea of transferring the facility was set aside. Although, she added that she agrees with the governor’s idea that the best way to promote a town is by way of having a “presentable” municipal hall as this is the first structure that visitors or any other clients look for to transact or visit. However, Mayor Petilla said the building’s historical value and location is more important at the moment. Instead, it was learned that of tearing out the whole two-storey structure that now houses many of the town’s municipal offices and build a new and modern one, the LGU is set to restore all its features and would only be replacing those parts which are dilapidated and badly need repairs. “We would be sending in a restoration team as they are the ones who knew better what should stay, what should be preserved. This is an old building and it has its own story to tell that we cannot just easily tear it apart and build a new one,” Mayor Petilla said in an interview. As a newly elected chief executive of the town, she disclosed that the Mayor’s Office were in disarray and noted of old and worn wooden planks at the building’s second floor. “There is so much to repair here, so much to restore that I hope we can all finish it within the next few years,” Mayor Petilla said. Already, the provincial government, she likewise disclosed has prodded Palo officials to immediately set out their plans and expressed their ready support for the building’s restoration.